We consider ourselves to be desert dwellers, but we enjoy it because the terrain is fast-paced, ever-changing, harsh and full of new difficulties to triumph over. Chris Leaming, the owner of XTC Power Products, was once a SoCal native, but he ventured to Arizona where their desert is vast. Chris’ company specializes in UTV electronic parts, such as street-legal turn-signal kits, and solutions to wiring up components to switches. 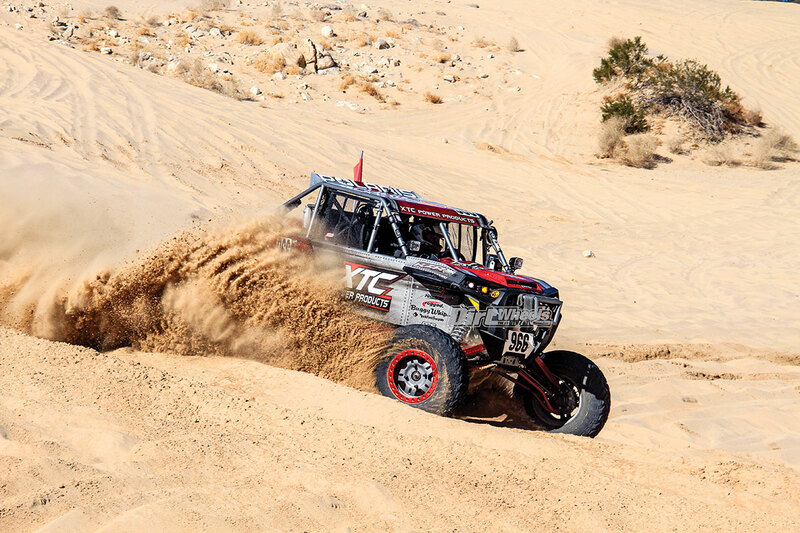 When you own a company in the UTV industry, the itch to race is one that must be scratched. Leaming built himself an impressive race machine for the Best in the Desert series. 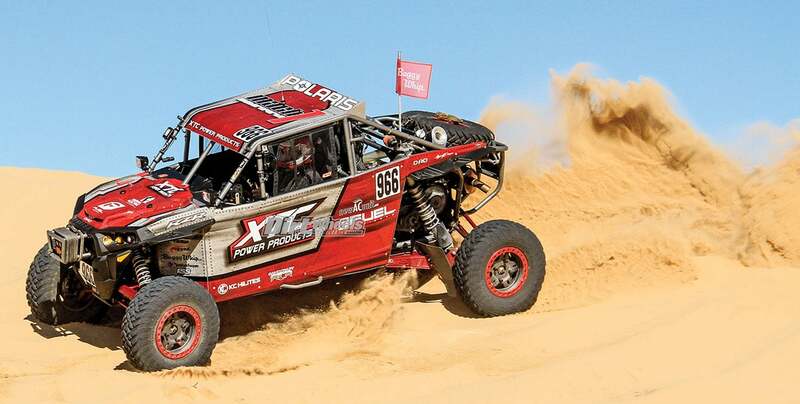 Weller Racing flashed the RZR XP Turbo’s ECU and tuned the clutch to give the machine more power and let it run at higher speeds. Chris went to the desert experts at Cognito Motorsports for one of their race-ready frames built to whatever specs you want. 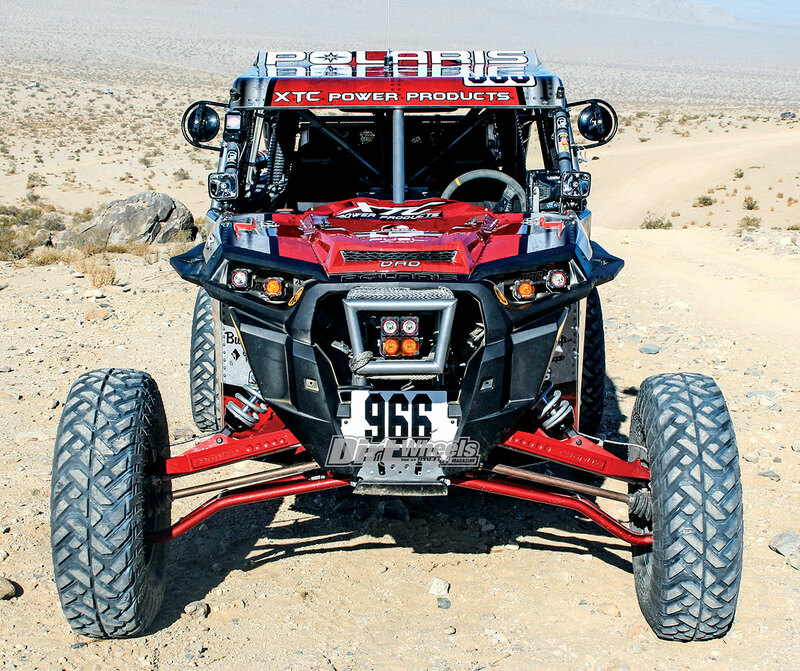 Leaming chose a RZR XP Turbo with a smoother-riding four-seater length that only seats two. The frame and roll cage are welded together as one piece, and virtually none of the original RZR parts get reused. Chris had Cognito build in a spare 32-inch tire carrier and weld jack points onto the frame to make changing a tire mid-race much easier. Cognito incorporated a rear-mounted CBR radiator location and space for a custom Fuel Safe 30-gallon fuel cell. BITD rules forbid opening doors, and you must run side-window safety nets. The side panels are tied into the body. The full wrap is from Wolf Designs. 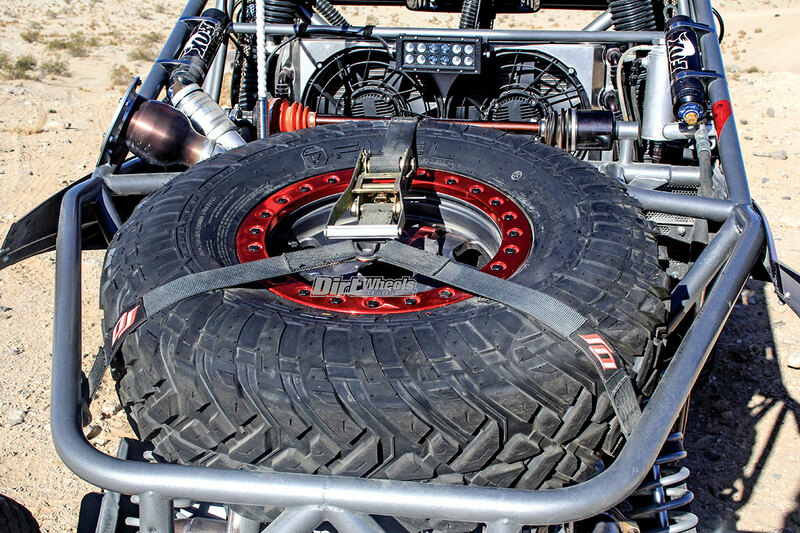 Chris has a spare RCV axle strapped to his RZR just in case one breaks. The CBR radiator has also been mounted in the rear of the machine. Chris understands that you need great suspension to go fast. He had a Cognito long-travel kit installed with rear sway bar mounts included on the trailing arms. 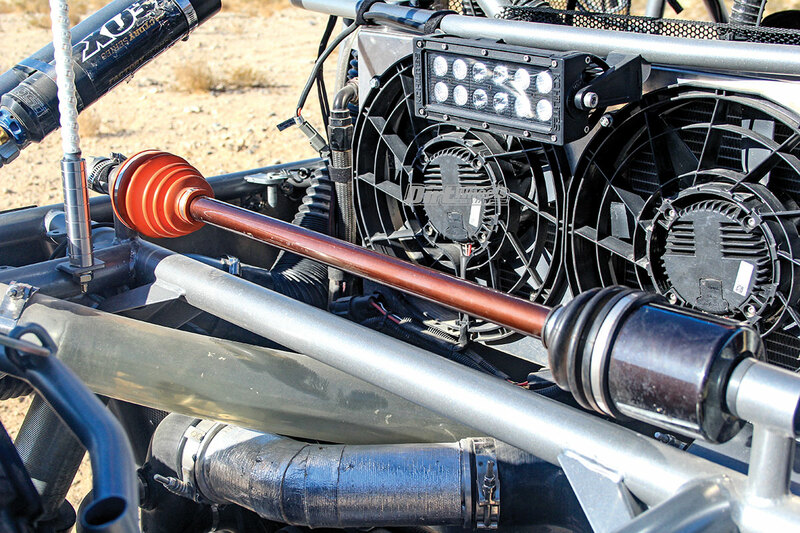 A Shock Therapy sway bar mount allows the machine to stay more composed while turning. We have been thoroughly impressed with how well the Cognito long-travel kit works. At Cognito’s recommendation Chris installed internal bypass Fox Podium RC2 2.5 front and 3.0 rear shocks. A set of very strong RCV axles were installed with the suspension kit. The dash of a race machine tends to be as straightforward as possible. The passenger side holds Rugged Radio and Racepak products. The motor gained an Agency Power Valvetronic exhaust system. The Valvetronic exhaust lets you run a straight pipe or push the exhaust gases through the muffler with a push of a button. When Chris is in race mode, he can run the straight pipe setting that lets the turbo spool faster and gain peak performance quicker. A diverter valve from Agency Power won’t leak under the increased boost from the ECU re-flash. Sandcraft RCR’s upgraded driveline combo kit comes with a GEN3 carrier bearing and stronger drive shafts. The front differential was rebuilt with a stronger sprag and 12-tooth armature plate. And last, the transmission gained an upgraded bearing kit. The Cognito long-travel kit and Fox shocks help this RZR soak up terrain with ease. 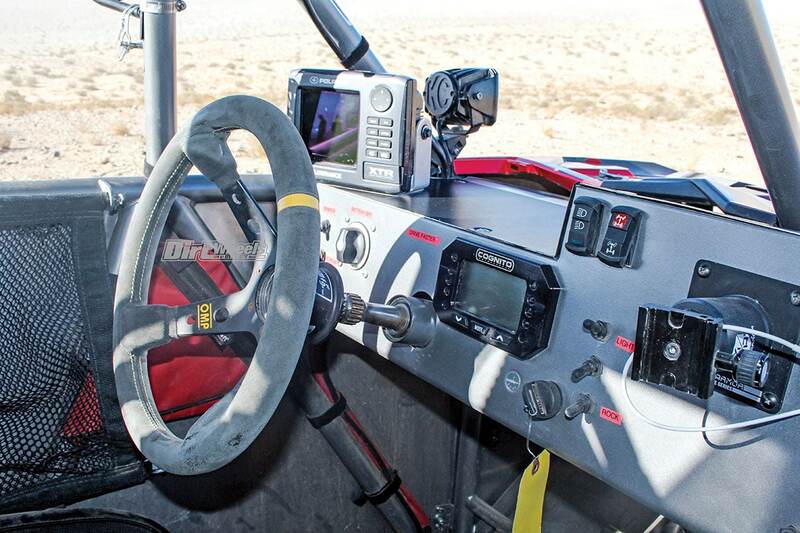 The cockpit of a race UTV is an important place to focus on. Best in the Desert races usually last a minimum of 250 miles and some extend far past that. You need the right navigation, communication and much more to have a competitive edge. Even the Mastercraft Pro4 seats and harnesses play an extremely important part in making the car perform. The XTC RZR is outfitted with a full Rugged Radios communication system that reaches car to car, out to their pit crews and even has Bluetooth capabilities to listen to music and answer cell phone calls. A Rugged Radios fresh-air pumper system for the occupants’ helmets was installed as well. KC HiLites products are all over this rig. 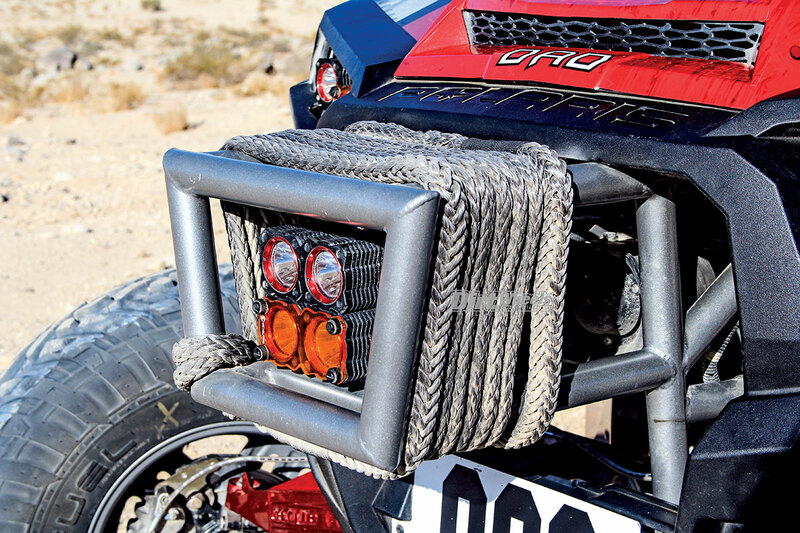 This quad set of Flex lights is nestled in the front bumper with a tow rope wrapped around it. The navigation system is comprised of an iPad that runs an app called LeadNav. You can install a GPS module that picks up signal through satellites to provide you with detailed maps and directions for your rides and races. You can get the LeadNav app outfitted with multiple options to suit your needs. The simplistic dash of the XTC RZR holds a complex digital display readout gauge from Racepak that the copilot keeps track of. The Racepak tells you the most crucial information on how the RZR’s engine is performing. It can even save and log data that you can look over after your race or ride. Some of the BITD races require night driving. Chris installed a 39-inch Pro6 LED light bar on the roof from KC HiLites. Flex lights replaced the stock headlights, and a quad setup of Flex lights sit snuggly in the race bumper. Leaming even installed lights on the A-pillars and a rearward-pointing light from KC to brighten up the night. The custom Cognito rolling chassis holds a spare tire in the rear. The desert is a harsh environment, and this is needed to keep racing when you get a flat. All of these products are linked with XTC Performance Products wiring kits, like their six-switch power control system, Power harness for the Rugged Radio products, a rear chase-light integration harness and more. There is even a switch that turns on the Buggy Whip 2-foot-tall safety flag on the rear of the machine. The XTC wiring kits make wiring up your electronic systems a breeze and are highly recommended. This build means serious business. The moment you sit down in the Mastercraft Pro4 seats and buckle the harnesses, you almost feel like you can tackle anything in your way. There is a lot of technology to focus on as the passenger, but as the driver, you are solely focused on going fast and keeping the car in one piece. The Cognito suspension kit with the Fox shocks are as impressive as we knew they would be. The ride is smooth and soaks up deep whoops with ease. The XTC Racing RZR stays composed and fast anywhere you point it. There is a ton of tools, spare parts and durable components on this rig. If you want to get into desert racing, take note of the way racers like Chris build their machines. They do everything with a purpose and never include a part that won’t improve the vehicle in some way. We hope to see Chris and his crew on the podium this year in the Best in the Desert series! This build has Cognito’s long-travel kit that adds width and stability to the RZR.